Missing 70 year old male has been located and reunited with his family. 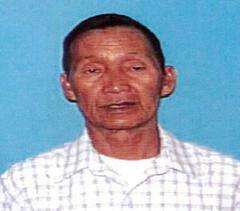 Description: Vietnamese male, 5’3”, 120 lbs, brown short hair, and brown eyes. He has words in Vietnamese tattooed on his right outer arm and two hearts with an arrow tattooed on his left outer arm. He was last seen wearing a light blue dress shirt, light colored pants, white socks, black sandals, gold necklace with a gold cross, and a medical bracelet which lists his name and family contact information. Last seen: 01/18/18 at 1 p.m. at his residence in Santa Ana. He left the residence on foot to go for a walk, which is common, but did not return. He knows how to return to the house but will not know his address. He often walks to St. Barbara Catholic Church (Euclid & McFadden), Mom's Supermarket (Edinger & Euclid), Asian Garden Mall (Bolsa & Magnolia) and Walmart (McFadden & Harbor). Vu may be in need of medical attention upon being located. He speaks only Vietnamese. If located, please contact SAPD Dispatch at (714) 834-4211, Detective Moroyoqui (714) 245-8731 or Investigator Jurado (714) 245-8353.